Jerry Seinfeld (born April 29, 1954) is an American comedian and actor. 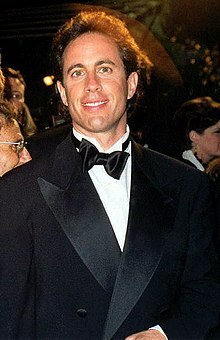 Seinfeld is known by many people for his television show, Seinfeld, which he created, wrote and acted in. The show won many awards. These included the Emmy and Golden Globe Awards. Seinfeld wrote the movie Bee Movie. He was the voice of a bee. Seinfeld was born in the borough of Brooklyn in New York City. His father, Kalmen Seinfeld (1918–1985), was of Austrian Jewish background. His mother, Betty (1915- ), is of Syrian Jewish descent. ↑ "Jerry Seinfeld's Biography". The New York Times. Retrieved July 18, 2010. ↑ "Jerry Seinfeld - Genealogy Family Tree". Geni.com. Retrieved 26 April 2011. ↑ "Jerry Seinfeld". Nndb.com. Retrieved 2012-02-05. ↑ "The Paper Trail of Jerry Seinfeld Leads Back to Ellis Island and Beyond". The New York Times. April 24, 2009. Her family identified their nationality as Turkish when they emigrated to the United States in 1917. This page was last changed on 21 August 2018, at 00:38.